Cross & Booties Baptism Cake. Gerbera Cake. 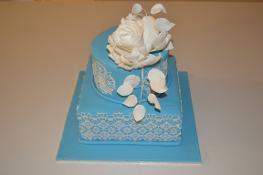 2 Tier Stencilled Cake with Peony Rose. The teacher and rugby player Bride & Groom. Edible Lace and Open Roses ... lovely for weddings or christenings! A simple and classic wedding cake that never goes out of style! Love these colours!! Fondant Ruffle cake with gumpaste roses. Swiss Meringue 'Ruffle Cake'(buttercream icing). A Gold Bow Cake for a 50th Wedding Anniversary. Baby Shower - with icing bunting on top (this would also look great with little clothes on a line around the cake)! A Shooting Stars style cake for a special 60th (with all her favourite things above the cake). 40th Anniversary Ruby Hearts Cake.